Breeders Club of America in Middletown, New Jersey announced today that they will be accepting Crypto Currencies such as Bitcoin, Bitcoin Cash, Ethereum, and Litecoin. Middletown, NJ, September 20, 2018 --(PR.com)-- Lamborghinis are the car of choice for Crypto Currencies enthusiasts but now, a puppy is the pet of choice with Crypto Currencies enthusiasts. 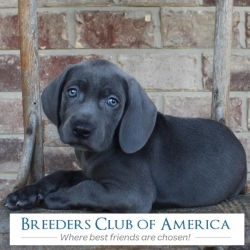 Breeders Club of America, a licensed kennel in Middletown, New Jersey has just announced that they are offering additional payment options for their customers interested in purchasing a puppy. Breeders Club state that they will be accepting Bitcoin, Bitcoin Cash, Ethereum, and Litecoin in addition to the multitude of other payment options they offer to make purchasing a puppy easier than ever. Breeders Club appears to be the first puppy store that accepts crypto-currencies in the tri-state area. The process to purchase a puppy using crypto is easy. At Breeders Club, customers receive health warrantees and Free Dog Training provided with each puppy purchased. In addition, puppies are up to date with their vaccinations and will be micro-chipped before going to their new home. You can visit with all of the puppies at Breeders Club of America, a licensed kennel located at 1839 Highway 35 North, Middletown, New Jersey. They are open 7 days a week and have a variety of puppies that are ready to find their forever home. However, if you do not see a puppy you like, a Breeders Club staff member can assist you in locating the puppy of your dreams through their Special-Order option. As crypto currencies become more mainstream and more businesses start to offer crypto currencies as a form of payment, who knows what else you will be able to buy. In the meantime, if you are searching for a new best friend and want to use crypto-currency as your form of payment, go to Breeders Club!